Carrie chats with elite runner and firefighter Kellyn Taylor! 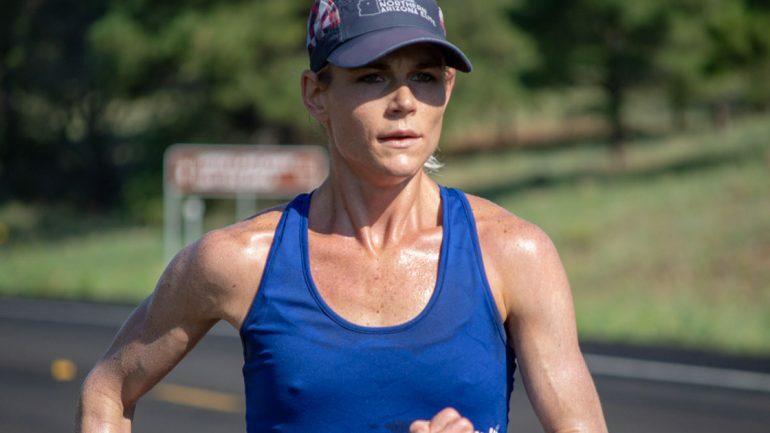 They discuss her marathon career (and how it took off right from the beginning), battling fatigue, training to be a firefighter, her next marathon, and how she and her husband raise their daughter. You’d be hard-pressed to find a tougher athlete than Kellyn on the pro running circuit. She’s a mom to daughter Kylyn, while at the same time running 100 miles a week and studying to be a firefighter. Yes, that’s right. When she finishes her running career she’s going to fight fires! In 2012, Kellyn finished tenth in the 10,000 meters and qualified for the finals in the 5,000 meters at the U.S. Olympic Track and Field Trials. In 2013 she was fourth at the U.S. 10 Mile Championships (54:19), the top American at the Bloomsday 12k, she won the Green Bay Half Marathon (1:12:27), was sixth at the U.S. 5k Championships (16:01), won the Woodrow Wilson Bridge Half Marathon (1:13:02) and was fifth at the inaugural .US National Road Racing Championships over 12k (39:47). In 2014 where she was 4th at the USA XC Championships, won the NACAC XC Championships, won the Collegiate Running Association 10k title, won the GO! St. Louis Half Marathon (1:11:51) and won the USA 25k Championships. She also PR’d at 5,000 meters (15:21) and finished 5th at the USA Outdoor Championships. In 2015, she shot to the top of U.S. marathoning, running a 2:28:40 at the Chevron Houston Marathon. She went on to PR at the half marathon (1:10:59) later that year as well. Her 2016 began with a 6th place finish at the United States Olympic Trials Marathon. She then PR’d at 10,000 meters (31:40.70) before finishing 4th at the Olympic Track and Field Trials at the same distance. She also qualified for the finals in the 5,000 meters. She kicked off 2017 with a 3rd place finish at the USATF Cross Country Championships. In April she finished 13th at the Virgin Money London Marathon in 2:28:51. In the fall she ran her first TCS New York City Marathon and finished 8th in 2:29:56. She returned the track in January of 2018 and set a PR in the Indoor Mile (4:33.40) at the BU Terrier Invite. In the spring, after a disappointing DNF at the Boston Marathon due to historically bad conditions, she bounced back in a big way with a win, a course record and a new personal best of 2:24:28 and the Grandma’s Marathon. In the fall she set a half marathon best of 1:10:13 to win the Rock ‘n’ Roll Las Vegas Half Marathon.